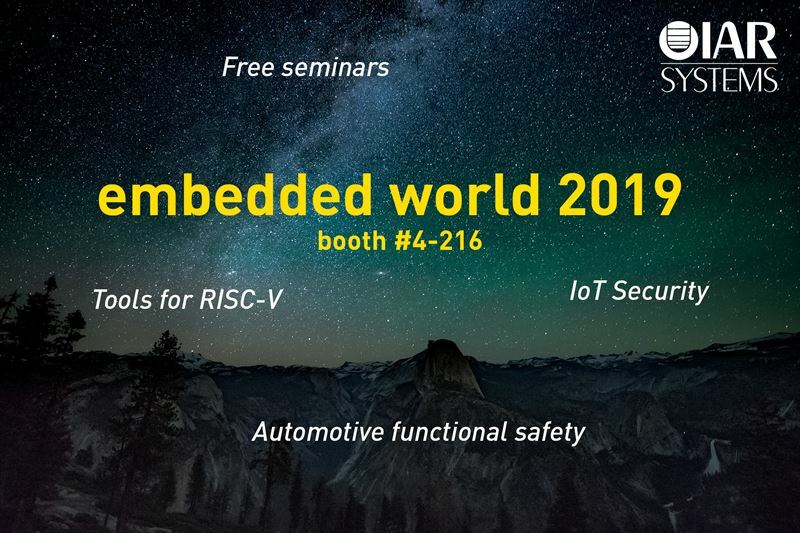 Uppsala, Sweden–February 7, 2019–At embedded world 2019, IAR Systems®, the future-proof supplier of software tools and services for embedded development, will present its ground-breaking technology for IoT security, developed with its sister company Secure Thingz, a global domain expert in device security, embedded systems and lifecycle management. In addition, the company will show its strengthened functional safety offering for automotive, and a preview of upcoming complete tools for RISC-V. The novelties are being presented as demos at IAR Systems (hall 4, booth 4-216) plus, like every year at embedded world, as free technical seminars for embedded developers. At IAR Systems’ booth, embedded world visitors can expect a full program of free technical 20-minute-seminars. On all three show days, experts from IAR Systems and its partners, including Si-Five, Microchip, Arm, Renesas and Amazon Web Services, give insights to embedded development and debugging, functional safety and code quality, and IoT security. Another demo that can be seen at IAR Systems’ booth is the not-yet-launched IAR Embedded Workbench for RISC-V. The toolchain will bring leading compiler technology, static code analysis and extensive debug functionality to the RISC-V community. IAR Systems stays true to its mission of providing embedded developers with complete and simplified development workflows. Together with Secure Thingz, the company is breaking new ground for innovative, extended workflows for ensured code quality, as well as compliance with legislation and industry standards, all integrated in the day-to-day work of the development team. Don’t miss IAR Systems at embedded world 2019!